We are hosting Club Scrub Spring Fling River Paddle III on Saturday, April 22. 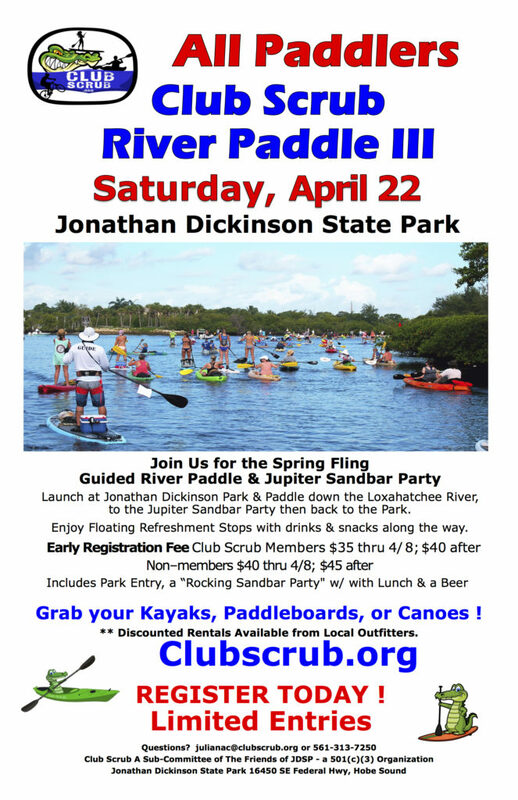 We will launch from Jonathan Dickinson State Park and paddle down the Loxahatchee River with the current stopping at refreshment stops along the way to the Jupiter Sandbar. The Jupiter Sandbar is where will have a party with lunch & drinks for a few hours, then paddle back to JD Park also with current. This event will draw over 450 paddlers and will be a one of a kind and potential historic paddle event celebrating the splendors of The Loxahatchee River and Jupiter. See manatees, fish, birds & other wildlife as we explore mangrove islands & estuaries along the way. It includes your park entry, a “Rocking Sandbar Party” with Lunch & a Beer at the Jupiter sandbar, along with floating refreshment stops, and paddle support (boats and guides). For videos and photos of our last year’s events, check out our Facebook page ClubscrubJDSP or go to www.clubscrub.org. If you need to rent, we will have a list of outfitters, that are offering delivery & discounts on the events page closer to event. Club Scrub builds and maintains 10 miles of Mountain Biking Trails in Jonathan Dickinson State Park. Our club’s main mission is to promote outdoor activities. We have over 2500 outdoor enthusiastic members.